Seton's Tyvek Tags are backed by our 100% Satisfaction Guarantee! Select from a wide variety of Tyvek Tags at competitive prices. Plus most of our top-quality Tyvek Tags are in stock and ready to ship today. Do not open tyvek tags warn employees of possible danger and advise them to not open valves unless marked. Equipment inspection tyvek tags inform employees and keep track of equipment inspections. Emergency shower tyvek tags help you keep track of important concerns regarding emergency showers and eyewashes. Barricade tyvek tags are made to withstand even the harshest of industrial environment, indoors or out. 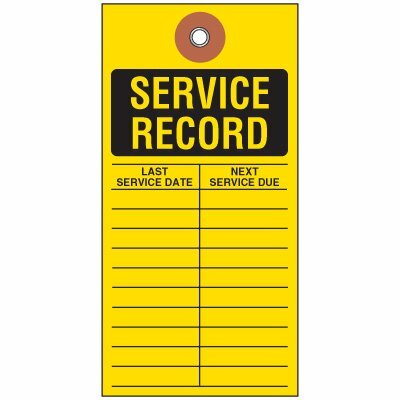 Service record tyvek tags are made to withstand even the harshest of industrial environment, indoors or out. Inspection record tyvek tags allow you to fill in inspection information keeping your workplace updated. Inspection record tyvek tags are made to withstand even the harshest of industrial environment, indoors or out. Ladder inspection Tyvek® tags help keep track of proper safety procedures. Do not operate tyvek tags keep employees updated on workplace information. Notice tyvek tags withstand the harshest industrial conditions and warn employees of possible hazards.